NASA astronaut Cady Coleman speaks during a change of command ceremony on May 22, 2011, one day before her planned return to Earth on a Soyuz spacecraft with Italian astronaut Paolo Nespoli (left) and Russian cosmonaut Dmitry Kondratyev. The three spaceflyers are ending their Expedition 27 mission to the International Space Station. HOUSTON — It's landing day for two astronauts and a Russian cosmonaut on the International Space Station, with the three spaceflyers due to return to Earth tonight (May 23) after more than five months living and working in orbit. Kondratyev, Coleman and Nespoli will depart from the space station while the space shuttle Endeavour and its six-astronaut crew are docked at the orbiting laboratory. Endeavour launched on May 16 to fly one last space voyage before being retired. The shuttle's six-man crew is currently midway through a 16-day mission to help support station operations following the end of NASA's space shuttle program. "I think we've done a lot of great science, and certainly I think the space station is in a really good state for the future," Coleman said during the change-of-command ceremony. This morning, the space station crew will begin the work day at 7:31 a.m. EDT (1131 GMT). Undocking preparations will start at 9:26 a.m. EDT (1326 GMT). 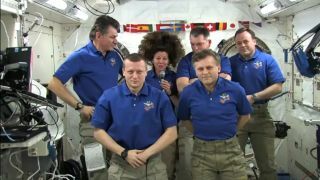 Several hours later, the astronauts will participate in a farewell ceremony with their crewmates before the hatches are closed between the station and their Soyuz spacecraft at 2:30 p.m. EDT (1830 GMT). Kondratyev, Coleman and Nespoli will undock from the station at 5:35 p.m. EDT (2135 GMT). After backing away to a distance of about 656 feet (200 meters), the spacecraft will pause for about 15 minutes, allowing Nespoli to position himself at a window in the Soyuz upper module to take video and photos of the space station and Endeavour. After acquiring a series of images and video, Nespoli, Kondratyev and Coleman will continue with their journey home. The Soyuz will conduct a deorbit burn at 9:36 p.m. EDT (0136 GMT Tuesday) before the spacecraft re-enters Earth's atmosphere.